The steep site unveils rich garden vignettes elegantly integrated through carefully crafted stone walls, stone paths, and abundant plantings. The stepping stone path sweeps down around the house changing scenes from a sunny rose garden to a shady glen, and grounds the visitor at bluestone terrace patios off the main living areas, which can be accessed from the interior through a collection of French doors. 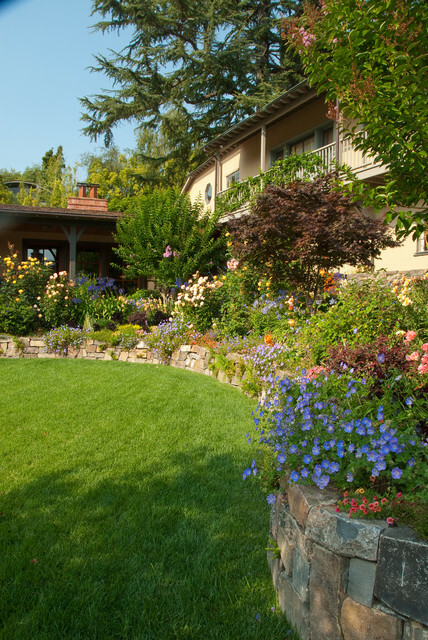 This Piedmont residence received the 2009 Design Award as the Best Remodel and Landscape.